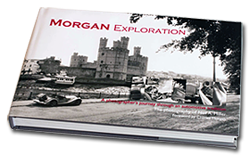 The book Morgan Exploration is an artistic study of the Morgan Motor Company and the people who have made it possible to reach its 100th anniversary. The content includes: images of the Morgan Motor Company in 1969, an appreciation of the equipment and materials used to make the Morgan Motor Car, an in-depth study of the employees and the environment of the factory, a look at the following of owners and enthusiasts, studies of the Morgan car as a work of art, a view of the current models and future designs, and a detailed narrative of a personal Morgan experience spanning 45 years. The book is interspersed with comments from Morgan Motor Company management, workers and Morgan owners. The book, 239 pages with over 300 photographs, is available in two versions. A standard 7.5” x 10.75” hardcover and a hardcover limited edition of 200. This limited edition comes in a slipcase and includes an original photograph. The selected photograph will be printed to museum standards, signed and matted to 14”x18”. Shipping to the Continental US – $6.00. All shipping outside Continental US $24.00. Morgan Motor Company as the official pictorial book for the Morgan Centenary Celebrations.